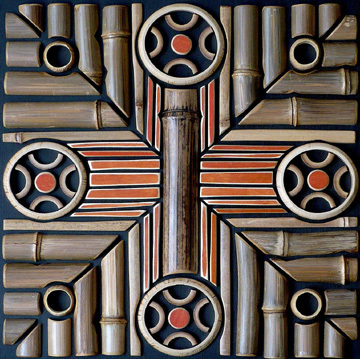 This bamboo and wood mosaic will be shown for the first time in the national juried Works in Wood 2015 at New Hope Arts. The idea for this started with all the talk about the California drought… The rainstick happened first. Then came rain drops, leaves – movement. I began to see a pattern taking shape from the rain lines criss-crossing over each other. I enter each mosaic project wanting to explore new territory, wherever that leads, and being open to experimentation. Creating this kind of work requires that you jump in, trust your intuition. It’s a very spontaneous approach with no preplanned pattern to follow, and always a multitude of creative problems to solve. I hear the sound of rain, and focus myself on conjuring up ways to make that visible, and visually exciting. 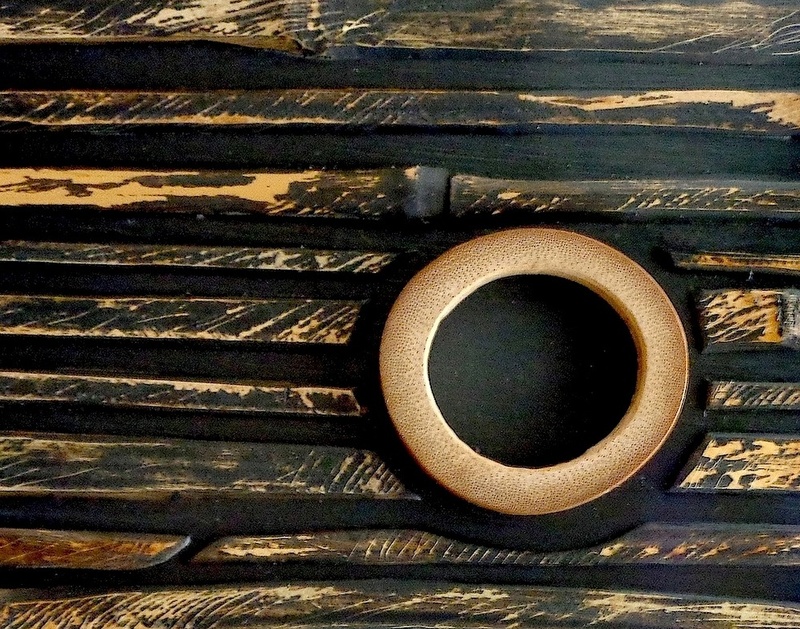 It helps to keep that first impression fresh – throughout all the wood-crafting and bamboo-cutting – until the thing comes to life. All the elements are vying for attention. You need to put them in their place somehow. That takes time and patience, but – you’re the conductor! 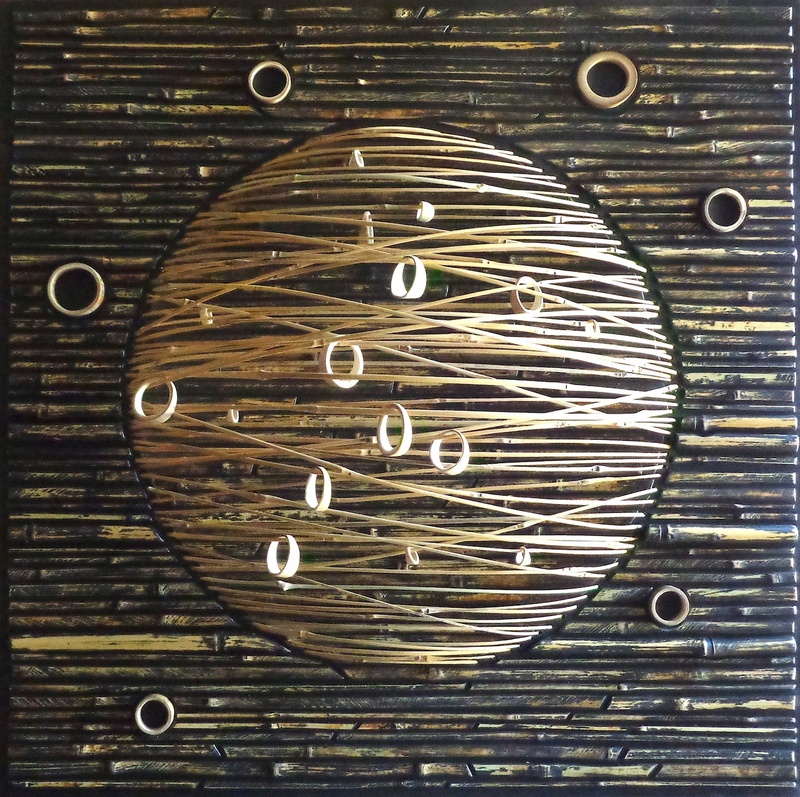 “Rain” and “Vigil” will be on view during the Works in Woodat New Hope Arts. This eagerly awaited show runs from November 13 – December 13. New Hope Arts is located at the corner of Bridge and Stockton, 2nd floor, in gorgeous New Hope, PA. 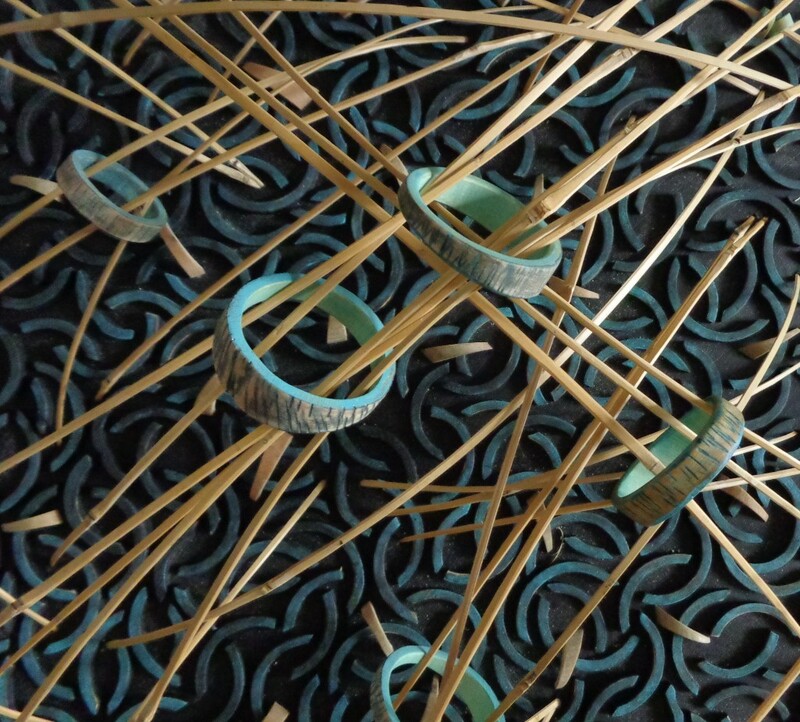 This is Gwen Shrift’s review of the currently running Members’ Exhibit at New Hope Arts. Each artist is exhibiting a single work. You have until September 27 to see such a wide range of work from your regional artists! New Hope Arts is situated at Bridge St. and Stockton Ave., 2nd floor. Hours are from 12 – 5 on Friday, Saturday, and Sunday. 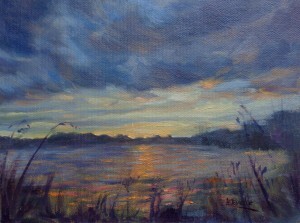 I have “Of Sea and Sky” on display there, which was previously posted on this blog. 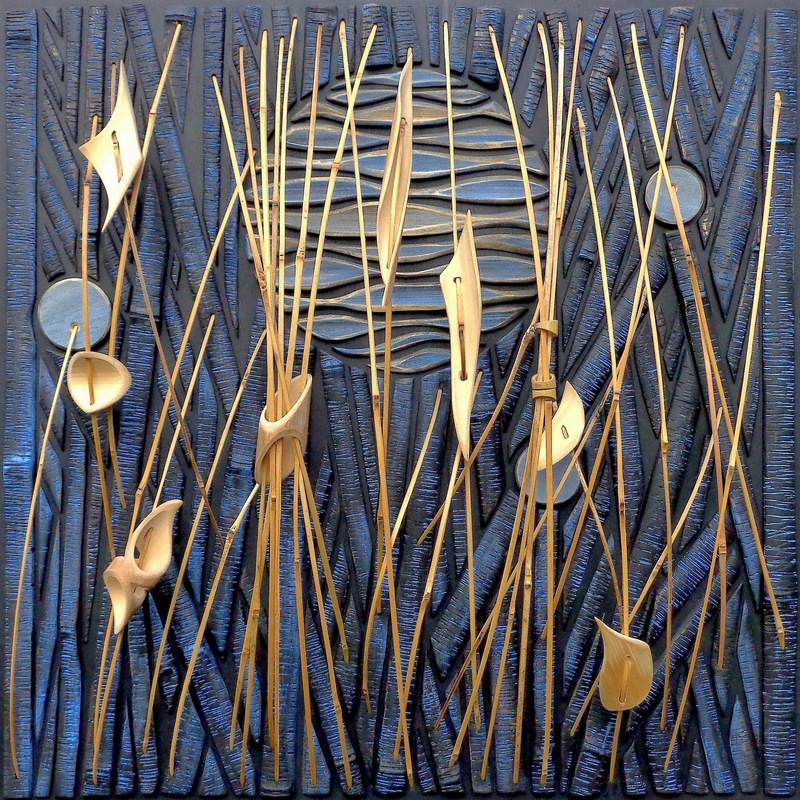 It’s a small mosaic consisting of natural elements: bamboo, vines, and small beach stones. I incorporated fishing line and a glass sphere in there too. Gwen Shrift described it well in the article! 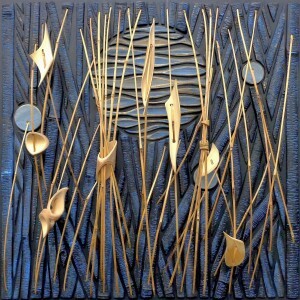 Bamboo Mosaic – Natural and paint-glazed bamboo, painted poplar wood disk, twigs, beach stones, glass marble, fishing line. “Of Sea and Sky” is the smallest mosaic I’ve done so far. 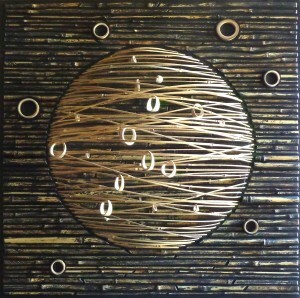 It was a thought that sprang from some of my recent mosaics on the moon, water, and natural elements. I visit these themes again and again – in paintings from my Meditations series, in silverpoint drawings, and in these natural mosaics. It’s a way to make something tangible of the abstract. I’m beginning to see a fusion of mediums emerge in my work. There’s always some peripheral experimentation happening…ideas that meander along a new path while the mind is focused on the project at hand. I take time and notes to acknowledge the presence of those fleeting thoughts before they vanish. I have no idea where they’ll lead, but I’ll go along for a ride – which means lots of exploration with materials – to maybe get to something exciting and surprising! We shall see. Please contact me if you have any comments or questions about my work. Find me on Facebook! Each mosaic that I create is linked in some way to previous ones. It’s a natural progression for me to want to expand on an idea – like these arcing strands of bamboo. 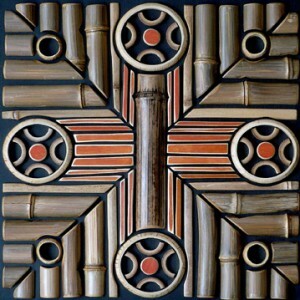 I’m still exploring this element in the all-bamboo work that is now under construction on a circular panel, 24″ diameter. 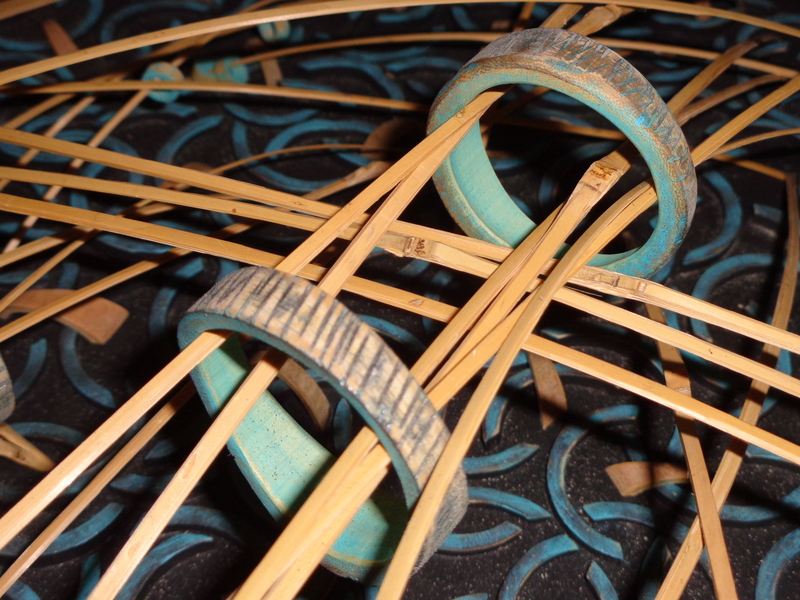 The bamboo rings are tooled, stained, and suspended in space by the arcing strands. While working on this, further ideas surfaced, that I will continue in the next mosaic. That’s the natural flow of creativity, in my world. 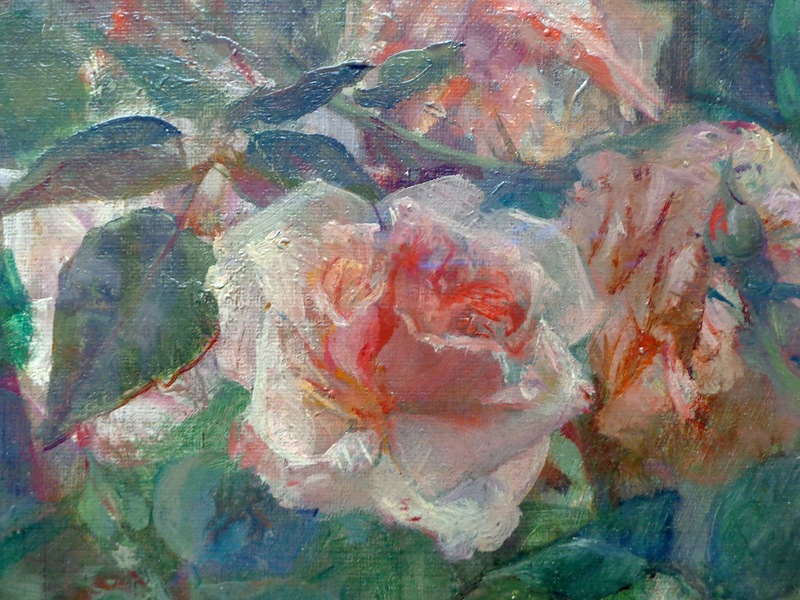 A recent visit to the Pennsylvania Academy of the Fine Arts (PAFA) in Philadelphia brought me face to face with the exciting brushwork of Maria Oakey Dewing. 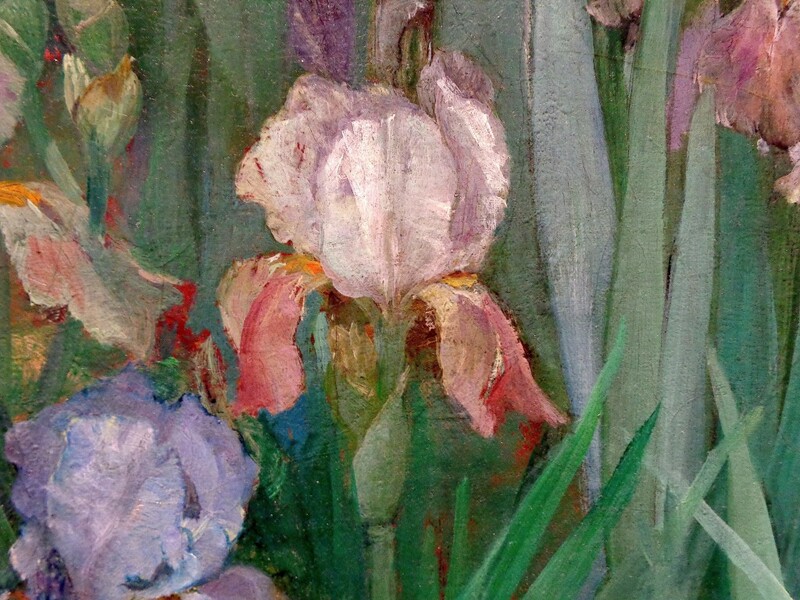 Her work is included in the current show there: “The Artist’s Garden – American Impressionism and the Garden Movement, 1887-1920”. 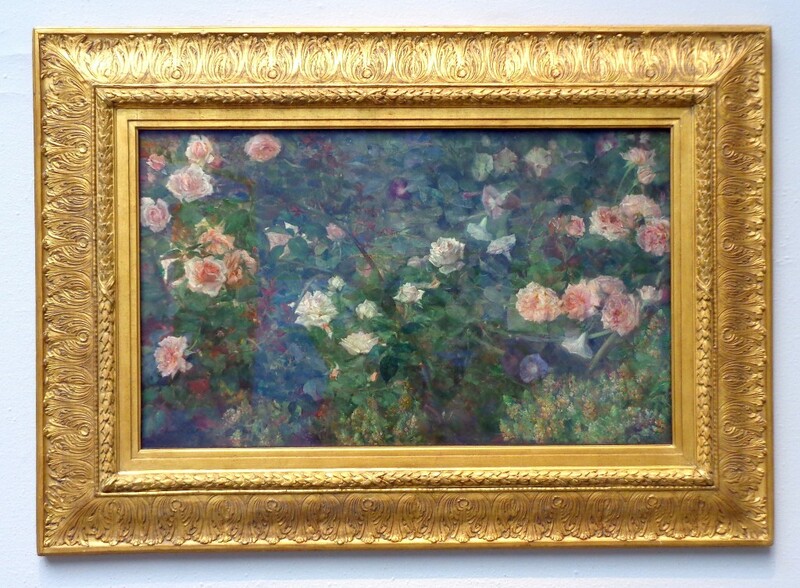 Don’t let the gilded frame overwhelm the painting, as there is so much to see. Take a close look at the individual flowers…layers of transparent glazes and modulated colors, fine outlines and bold splashes of color, etc. Click on the link Pennsylvania Academy of the Fine Arts for more info about this exhibition in Philadelphia. 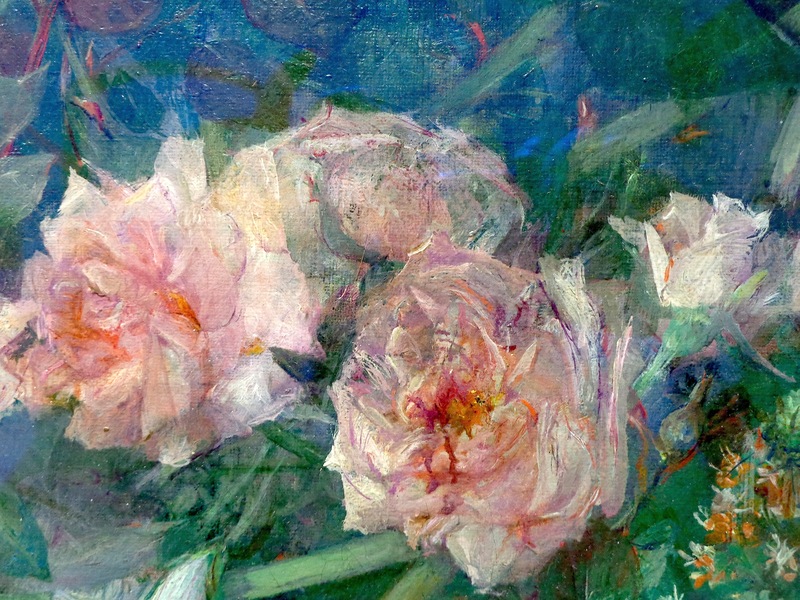 “The Artist’s Garden – American Impressionism and the Garden Movement, 1887-1920” is on view until May 24, 2015. In between the hubbub of woodwork exhibitions, I took some quiet studio time to paint this small Impressionistic landscape that was inspired by a dramatic sunset over Core Creek, in Bucks County, PA.
A note about using reference photos: There are times when I paint outdoors, directly from Nature, quickly recording the essence of that changing scene. If I’m unable to complete the work on site, photos may help when finishing the painting in my studio. Or, they may not help at all. That is, they may be a such a hindrance to creativity that you find yourself trying to duplicate that photo image instead of working from your memory’s first impression of the scene and sensations that attracted you. 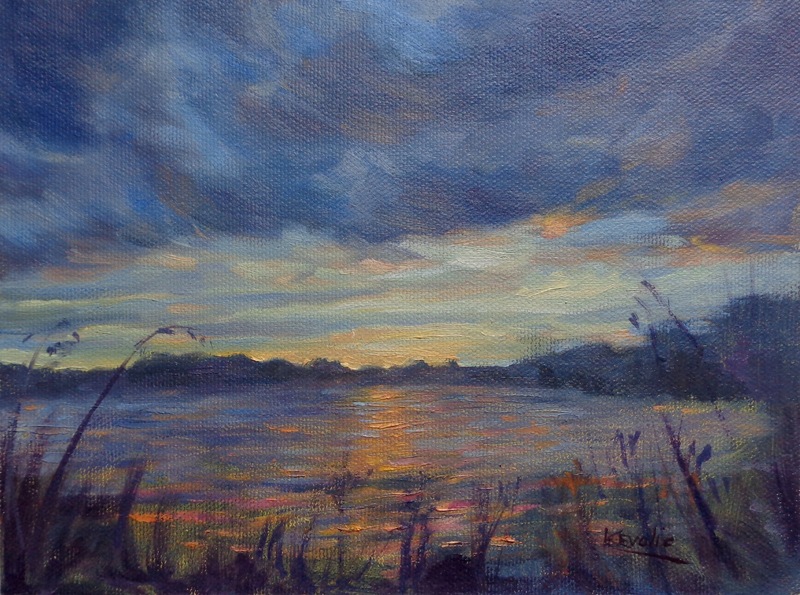 This painting, and a handful of my other landscape paintings, are available for purchase from Canal Frame-Crafts Gallery in Washington Crossing, PA.
Update: “Sunset at Core Creek” has been SOLD. Please contact me to know more about other available works. 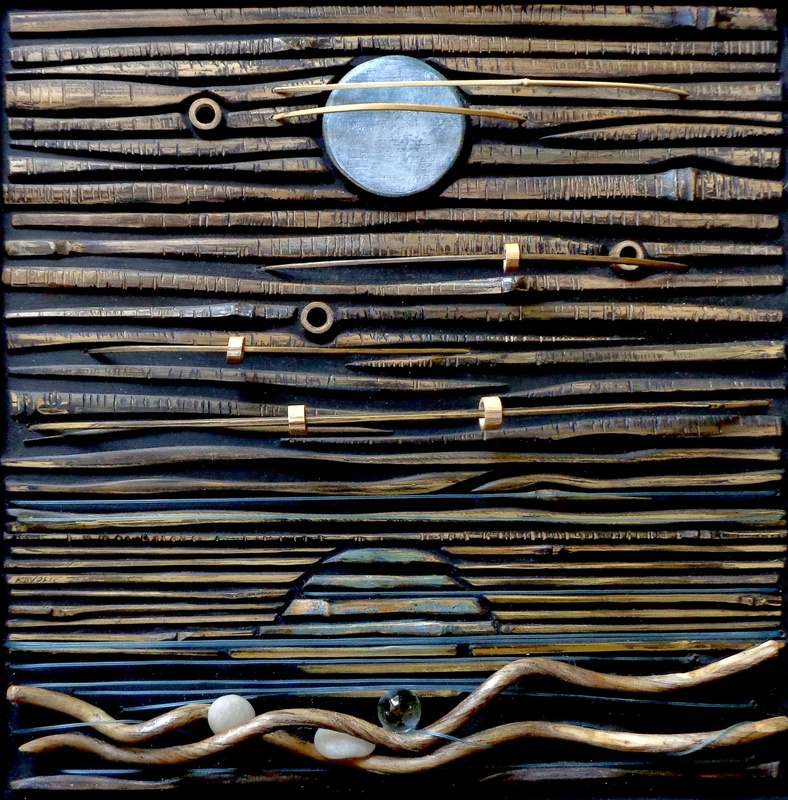 For the month of February, New Hope Arts is showcasing the work of the ten artists who were selected by Ellen Bradshaw of Pleiades Gallery NY, during the Members’ Show of 2014. 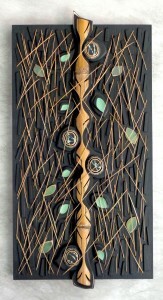 My bamboo mosaic, The Dream Keeper, was one of the works selected. This, and five more of my natural mosaics will be included in the presentation at New Hope Arts. Read my NEWSLETTER for more about the inspiration behind these works. NHArts is located at 2 Stockton Ave., 2nd floor; click link for more info, or call 215-862-9606. Our show runs until February 22. Get out of the house – take a scenic ride to one of your favorite river towns! This is my latest work in bamboo. 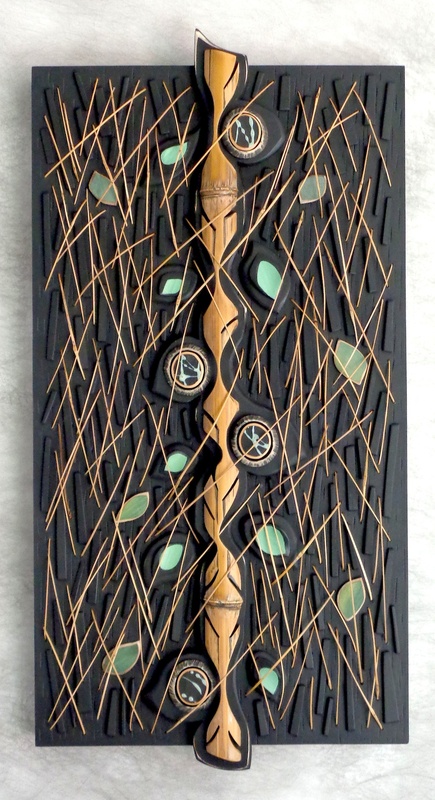 A lot is going on here: The “moon” motif shows the inside of a section of bamboo that I worked into mosaic tesserae, to which I applied a pale blue paint glaze. 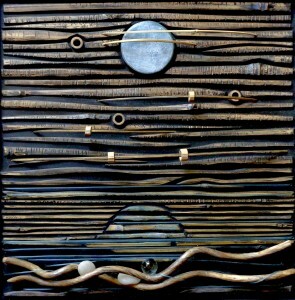 The space around the moon is bamboo that I’ve tooled on the bandsaw and added paint to, which gives the effect of tree bark. These pieces together evoke a forest. I created a “moon glow” patina by wiping and sanding off some paint and letting other rest in the saw kerfs. 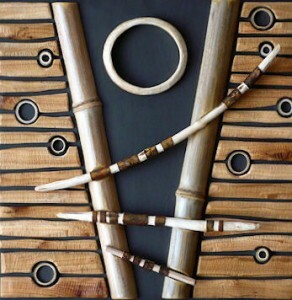 The “offerings” are elegant pieces of bamboo that I tooled and attached to the long arcing strands; these are movable elements. These strands and all of the pieces are made from a few poles of bamboo – this is what keeps me enthralled with this natural, extremely versatile medium! Read more about the inspiration behind these works in my NEWSLETTER. 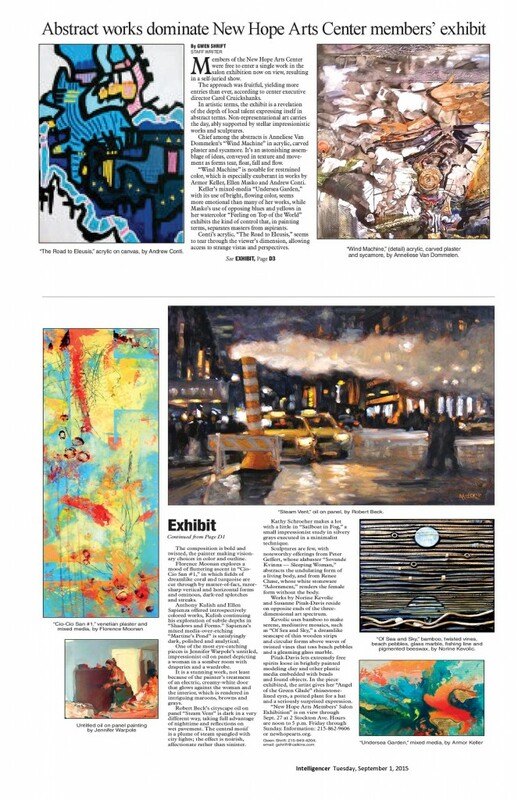 “New Hope to New York” is the name of this year’s New Hope Arts Members’ Show. Ellen Bradshaw, president of the Pleiades Gallery in New York, was the juror for this show. I’m honored to be among 10 artists whose work was selected to go to the Pleiades Gallery in New York for their group show in December and January. Thank you, Ellen! Away from the too-rough fingers of the world. 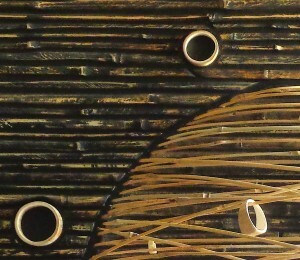 Here are a few more detail photos of my latest bamboo mosaic. 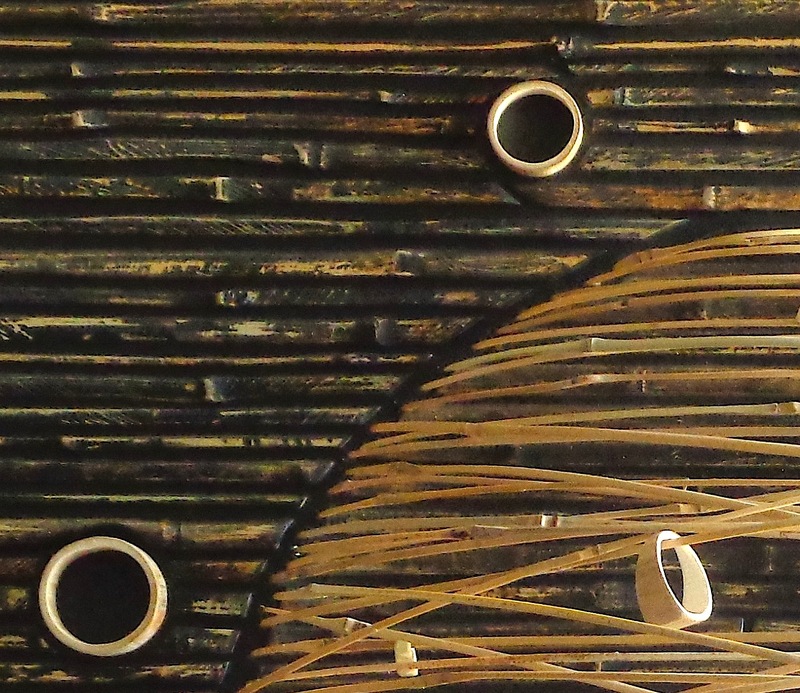 You can see the umber paint-glaze I applied to the bamboo strips of the background. By scratching through the glaze I’m able to control the tonal areas, making an area lighter by degrees. I’ll post the finished work soon.